Mitsubishi will present a concept of a sporty electric vehicle at the Geneva auto show in March. The convertible Mitsubishi i MiEV Sport Air is based on the four-door Mitsubishi i MiEV production electric vehicle. 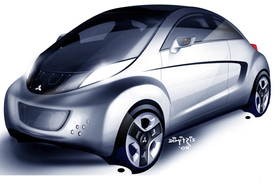 The i MiEV, which has a mid-mounted electric motor, will go on sale starting next June in Japan. The Sport Air concept focuses on the sporty performance and driving habits of future electric cars, while emitting no CO2 emissions. The Japanese carmaker refers to the i MiEV Sport Air as a pocket rocket, pointing to a direction a sportier Mitsubishi electric vehicle may take in the future. Mitsubishi recently began feasibility tests of a left hand-drive version of the four-door i MiEV in Europe, preparing the car for market introduction in Europe and the U.S. in 2011.